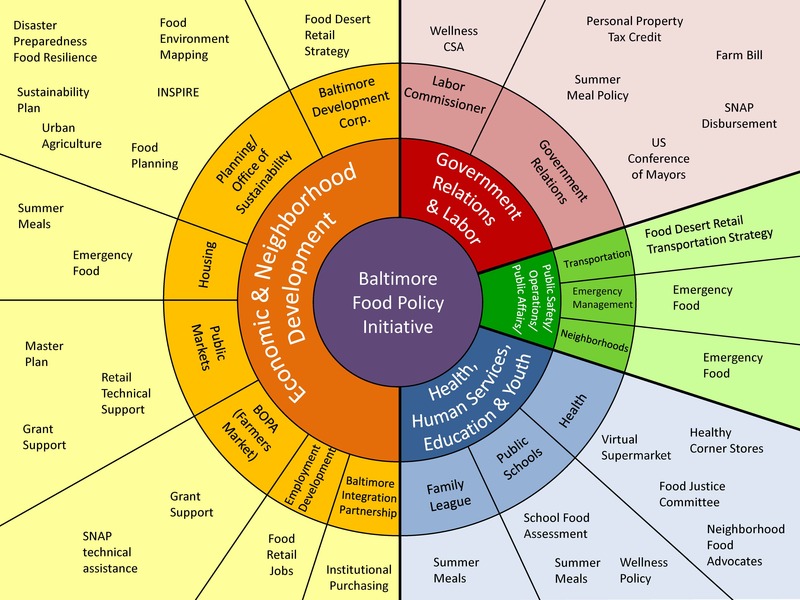 The Baltimore Food Policy Initiative (BFPI) – an intergovernmental collaboration between the Department of Planning (DOP), Office of Sustainability (BOS), Baltimore City Health Department (BCHD), and Baltimore Development Corporation (BDC) – was founded in 2010 to “improve health outcomes by increasing access to healthy affordable food in Baltimore City’s food deserts”. With each agency lending its expertise, the City creates comprehensive strategies that tackle food access from many perspectives, and implements programs and policies with multi-sector support. The Department of Planning has led the effort to refine the City’s food agenda and priorities through sustainability and food access lenses, and has incorporated food into a variety of plans and policies. The Baltimore City Health Department is committed to making Baltimore a city where all residents can realize their full health potential, through cross-cutting collaborations and innovative community-based food access programming. The Baltimore Development Corporation, recognizing that food is a catalyst for economic development, offers retailers, small food businesses and food entrepreneurs access to information, resources and incentives.